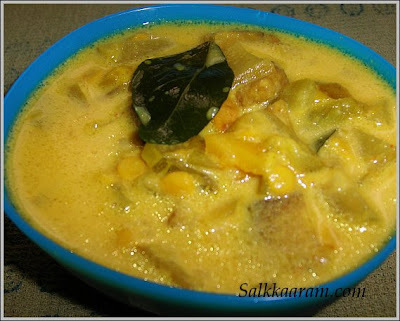 Kadalapparippu pachakkari / A mixed vegetable Curry | Simple and Delicious ! 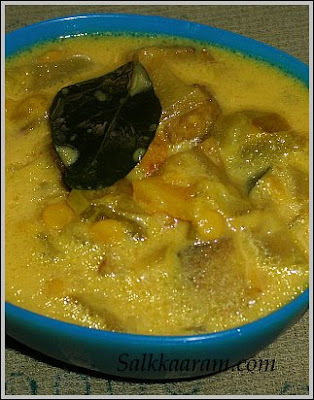 This curry is similar to our "Olan" which I haven't posted yet.This was in draft for long, so now it is time to bring it out.I prepared this when I had some leftover 'sambar kashanams'.So this way is good to finish them..Goes well with rice. Cook vegetables with water, turmeric powder,chillipowder, green chillies and salt. When cooked add prepared dal into it. Mix and boil again. Add the coconut milk powder and mix very well. (Make the curry enough thick according to your taste).Boil , add curry leaves and pour coconut oil over it. Remove from fire and keep the lid closed for some time..
Wow one of my favourite curries. Wish i had this with plai rice, delicious. pinne nale njan nattilekku varuka aanu ..for 2 weeks..
Seena,almost like koottucurry ? looks yummy.will try.how r you dear ? Wow, so many veggies go in this curry :) Very delicious with touch of coconut! Wow...the colour of the gravy looks so appealing! looks very nice and glossy! This sounds so traditional. Look so good. Nice recipe. YUM! nice healthy curry Seena! looks so colorful and yummy! hey seena! wish u happy new year ! kadalapparippu pachakkari super :) in konkani cuisine, we use kadalapparippu with ripe banana to make a sweet curry called Kelya Ambat. This is quite new to me, Seena! Any substitute for the coconut milk powder? We get it here but I don't want to buy a big pack just for this dish. Sounds lovely. This should be very nice with chappathis, I think. Happy new year!! I am not familiar with this curry but just the coconut milk-coconut oil combinaation sounds too good. will try it asap. I want to try your vegetable biryani it is top of my list of recipes to make.